Numerous local stocks have been hammered by recent news flow and/or simple aggressive sector selling in an already nervous market. In this wire, we outline our view on 11 of these market casualties. We continue to have zero interest in KGN and ponder the 2 directors aggressively selling down their holdings, including Ruslan Kogan, when the stock was double the price only a few weeks ago; it’s a brave (at best) investor who buys a director’s shares! BWX fell -16.2% following another trading update, in this case putting the blame at the feet of the failed management buyout (MBO). The skin and hair care products business are sticking to its profit guidance but that will need a 70% skew to the second half of the year – the market's clearly not convinced. I see no reason to jump into BWX at this stage. Corporate Travel went into a trading halt as it responds to a scathing research report by investment firm VGI Partners. The 176-page report names 20 ‘red flags’ that VGI have used to justify their heavy short position - CTD has fallen -18.4% since its early September highs. The report lists reasons such as low interest income, growth through acquisitions, ‘non-existent’ offices, suspect accounting practices with a long-serving auditor and high management turnover (except for the CEO & CFO) in its reasons for the negative view, as well as noting the significant number of management share disposals over the past few years. Potentially this is a case of “throw it against the wall and see what sticks” with VGI already short the stock, however a small review of offices shows numbers may be overstated, particularly in northern Europe. I see no reason to catch this falling knife when the stock reopens this week – trading around $20 would not surprise us. Now moving onto 5 other stocks who have endured a time they would rather forget over recent weeks. Fast fashion jewellery chain corrected over 35% since June driven by concerns around valuation following a trading update showing store sales growth below expectations. The stock's now trading on an estimated P/E of 21.6x for 2019, not excessive but we are wary of the Australian retail sector. 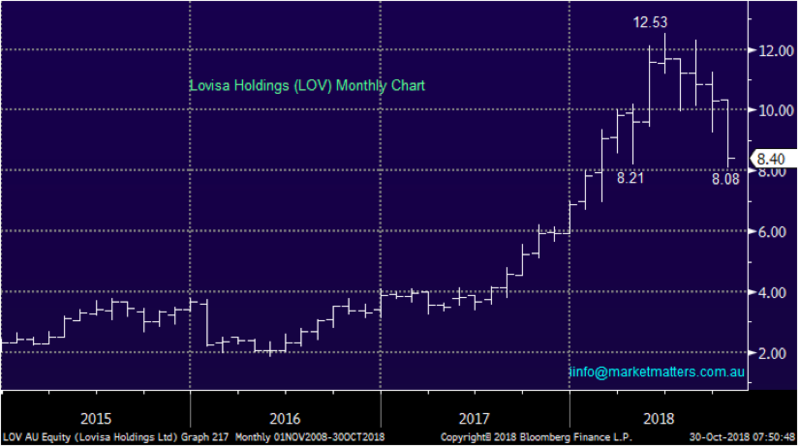 MM is not planning on purchasing LOV but if we were looking to gain some exposure to the beaten up sector, LOV around $8 looks interesting. 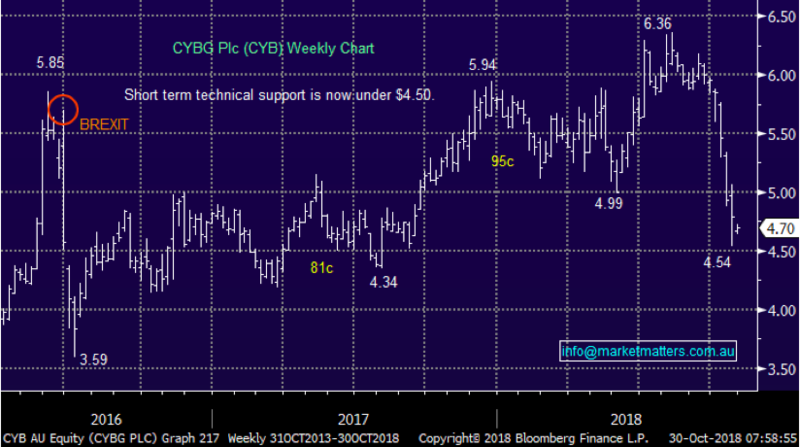 The UK bank CYB has corrected -28.6% since August, significantly underperforming the local sector as a messy BREXIT appears to be just one factor weighing on the stock. The owner of Clydesdale and Yorkshire banks in the UK has been struggling since warning that mortgage competition in the UK is increasing although management is optimistically sticking with its net interest margin target – if they achieve this moving forward the sell-off is overdone in our opinion. Technically the bank has solid support around $4.50 while it also trades at a steep discount to its book value. MM is unlikely to purchase CYB in the short-term but it is on our radar. 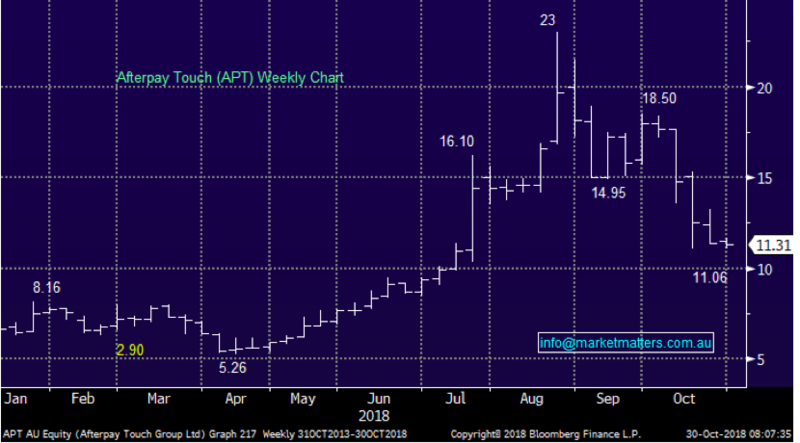 APT has corrected over 50% since late August as crazy valuations came down to earth with an inevitable thud. The bulls on APT sighted massive growth in users that would translate into earnings at some point. Additionally, they now have the potential for a ‘senate enquiry’ into the sector. MM sees no reason to buy APT here (just yet) although the easy money shorting the stock has gone in our opinion. 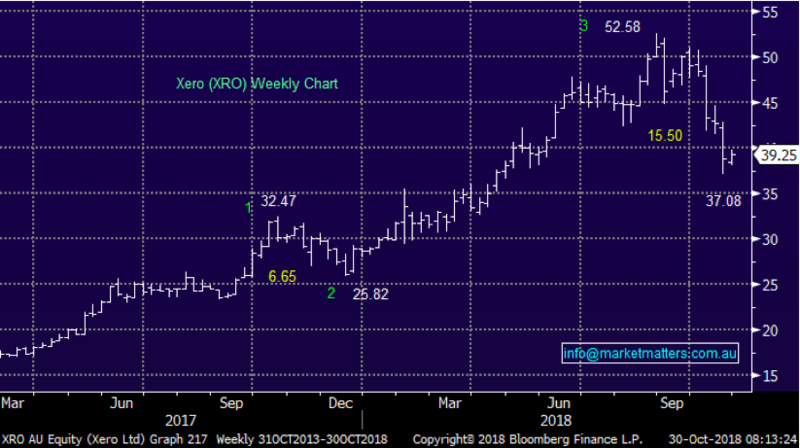 Cloud accounting and business provider XRO has corrected almost -30% since the end of August but this is a quality business with sustainable growth and ‘real earnings’. The question is obviously what price to pay for this growth, a tumbling NASDAQ is certainly not helping sentiment around the stock – XRO has corrected 30% and the NASDAQ 14.7% over recent weeks. We like XRO as a business and could consider “nibbling away” in a small manner, the further under $40 the better. 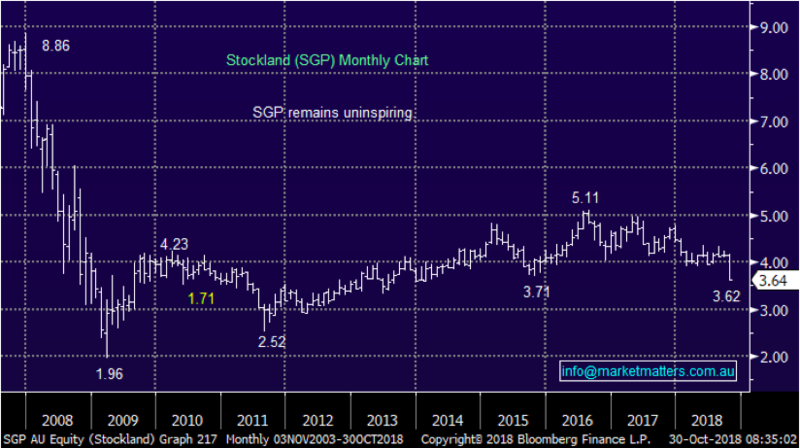 Australian property group Stockland has corrected over -13% this month following its quarterly update which confirmed residential trading conditions are moderating – no surprises there! The companies $350m buyback remains in place which is clearly supportive of the stock but it’s hard to see investors chase the stock until we get a feel for the bottom of Australian housing. SGP is not for us at present. Emeco Holdings (EHL) 26c – Engineering business EHL has corrected over 26% in the last 2 weeks, technically we are bearish looking for another 10% downside. AMP Ltd (AMP) $2.36 – corrected over 30% in the last week, a stock we covered a number of times in recent weeks or months, MM still has no interest until further notice. Iress (IRE) $10.76 – The equity data provider for Australia and New Zealand has fallen over -25% from its August high and over 20% since we took profit close to $14. We remain bearish with a technical target ~10% lower.